Chris Hughton says how Albion respond to defeats this season is going to be key. Brighton have suffered back-to-back defeats at Bournemouth, in the Premier League and then Carabao Cup, and now return to league action at home to Newcastle on Sunday. 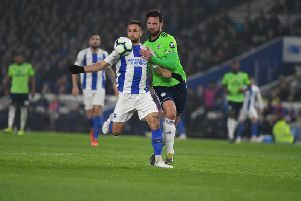 Hughton, whose side have four points from five matches, said: “The key is going to be responding to them [defeats], putting them in the past and very much focusing on the following games. “You have to be as happy as you can be with the majority of what you’re seeing, whether that’s in games or in training. “I think that can always be encouraging, and certainly in amongst a group of lads who had recognised that this is going to be a tough season. “Their mindsets have been very good and the training has been excellent. What we need to do is put as much of that into practice in the main arena, and the next opportunity to do that is against Newcastle. “We’re at home and we have to try and capitalise on our home form. But we know that we’re up against a very good Newcastle side that are in good form." Hughton knows the importance of making the Amex a difficult place for teams to play and said: "It will be vitally important for us. It's the law of averages that each team will probably get more points at home than away. "We were very good at home last season and wonderful support that if anything got stronger and better as the season wore on. "So far this season they have been excellent. "They will turn up in their thousands and do their best to get behind the team, but we have to give them something to cheer."